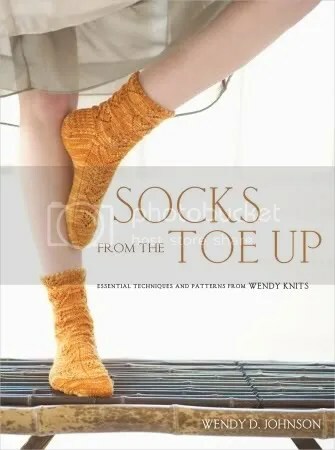 I have a review for you this week, dear blog readers, this time for the recently released book Socks from the Toe Up, by Wendy D. Johnson. This book has been in wide release for a month and a half or so, so some of you may already have had a glimpse of it. 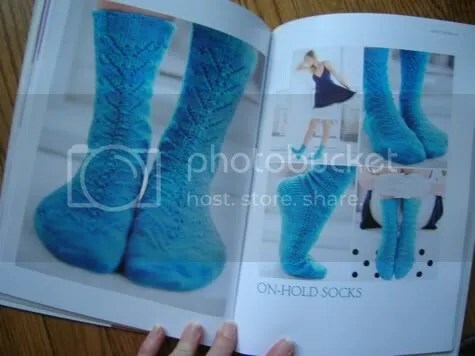 Some of you may also be familiar with Wendy’s blog, and although I am not a regular reader of her blog I know enough about her knitting style to know that it makes sense that she would pen a book dedicated to toe-up sock knitting, since it is her method of choice for sock knitting. Let’s have a brief look inside the book. One high point of Socks from the Toe Up that bears mentioning is that it is technically strong. There are several pages devoted to techniques like toes, heels, and bind-offs which are useful for toe-up knitting. If you’ve dallied with toe-up sock knitting before, many of these techniques will already be familiar to you. If not, they are presented here with helpful images to make the process as painless as possible.There are instructions here for 3 different kinds of toe-up toes, heels (including the ubiquitously cuff-down slip stitch heel), and bind-offs. 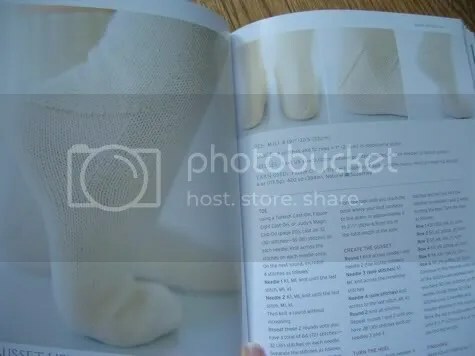 The technical ‘part a’ of the book is followed by the sock patterns ‘part b’, which in turn is subdivided into ‘Basic’, ‘Lace’, ‘Textured Gansey’, ‘Cabled’, and ‘Sportweight’ Socks, although these last three sections contain only 2-3 patterns each. Not counting the basic socks (which would be an excellent starting place for those new to toe-up), there are 20 patterns in this collection. The patterns are knit in a variety of trendy and colourful yarns, and are certainly meant to be eye-catching. Lots of bright colours and strong photography here. I like the look of the Lace and Cable Socks (above), which could be versatile for a number of sock yarns. I was also intrigued by the Vandyke Socks (below), which are knit in a single skein of Dream in Color Classy, and therefore likely to be a speedy knit. Socks from the Toe Up is in general a nice addition to a sock knitter’s library. In the end, my only concern with it is that I am still left wondering why the book does not do more to convince readers why we should be knitting socks from the toe up in the first place. Other than a brief note early on about the convenience of being able to use up all the yarn in the skein without worrying about running out, there is very little attention paid to answering this question. 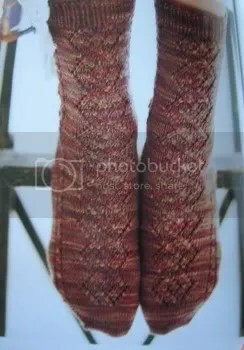 For example, from a toe-up sock book, it is surprising to me that other than the lacy patterns, many of these socks could be virtually identically reproduced working from the cuff down. Perhaps I am under-selling the usefulness of yarn economy (which make no mistake is quite useful), but I think there was a big missed opportunity here. There are lot (a LOT) of sock books out on the market these days, and any new offering needs to distinguish itself from the others in some way. Either the ‘why toe-up’ question was not considered necessary enough to devote time to it, or the publishers are assuming that anyone who buys the book already wants to knit from the toe-up and does not need convincing. There are certainly valuable traits to toe-up sock knitting that have nothing to do with efficient use of yarn – what about customizing fit? or the difference of working certain patterns in one direction versus another? I wish Johnson would have done more to emphasize such benefits or differences involved working from the toe-up. Overall this is a nice collection of patterns, and for knitters looking for a new set of sock patterns to work their way through, this will be a good book to add to the collection. If you are looking for a handy set of instructions about how to work socks from the toe-up, then this will also be a very useful book. If you’ve had a chance to look at this book yourself I’d be curious to know what you think, or if you have a favourite pattern from it. I think it was just made as socks from the toe up because Johnson knits all her socks that way, she has a huge following that wanted her to write a book, and she started designing sock patterns. That’s pretty much it. I’m interested in seeing the technical stuff in part a, but I probably wouldn’t find a ton of use out of this book, personally. I purposely didn’t buy this book because I felt it lacked anything that was new. Most of the patterns are pretty ho-hum and all been done before in one way or another. I agree with you, a good sock book has to really be unique and this one just doesn’t do it for me. I am a huge toe-up fan for the two reason you mention: using every last inch of yarn; and fitting the socks as I go. I guess I am one of those who doesn’t need convincing! But given the hesitancy I encounter when I try to convince my s-n-b buddies, I bet there are plenty of knitters out there who DO need a good reason to try toe-up. I don’t have any sock books in my library, so I would probably add this one, since toe-up is the only way I knit socks. I picked up a copy of this book primarily for the different toe and heel techniques when working a toe-up sock. In general, I’ve been very unhappy/unsatisfied with the toe-up pattern cast-ons I’ve used, and I don’t like the short-row heel that seems attached to most of them. I liked that there was a good amount of technical information on different constructions. I’m sort of ‘meh’ on the rest of the book. I think if you like knitting socks just for the sake of knitting socks, there’ll be something in there you can knit (or lots in there, depending on your taste). For me, I like something a little more out of the ordinary if I’m going to knit socks these days. Thanks for the great review. I am a Wendy follower & learn to knit my 1st sock from one of her generic patterns. I love the seamless toes as I do not have to do any grafting which I am bad in. I am among those who need no persuasion to knit socks toe-up, mostly because I have a near-pathological aversion to grafting toes. 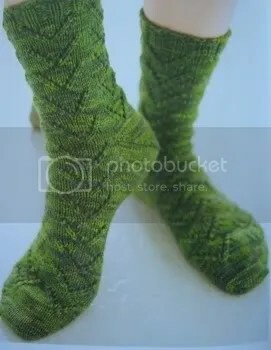 Those of us who like toe-up socks have found darned few patterns for this technique, in comparison to the plethora written for cuff-down knitting. I love the book, in part because of the strong technical section, which will be useful if/when I decide to design my own socks. The only thing missing, for me, was a discussion of how to convert cuff-down patterns to toe-up, as some of the really “hot” patterns are written for cuff-down only and I’m not a strong enough sock-knitter now to wing it. I found the content to be dead on with what I used to see every day in her posts. She knits toes up socks – masses of them – to my eye almost indistinguishable from each other without any suggestion as to why one would bother. I stopped reading her blog because it felt like watching a compulsion rather than witnessing creativity or the creation of beauty. It also seemed bereft of inspiration or passion. The styling of the book, unlike the content, is inspired but without her words to express the reason she is passionate for toe up construction it has to work alone. I think it tries too hard and the resulting disconnect is the flaw in this work. I agree with Stephanie – the publisher wanted at Wendy’s established audience, she already had the content in her blog. They struck a deal to put it all together. Her following will buy her book because they are her following. The publisher hoped a slick format alone would sway top down knitters. All I know is it didn’t sway me. i have a tendency to mindlessly knit socks and i don’t always pay attention to how much yarn i’m using. i knit socks frequently, and i’ve had to rip out several pairs because i get to the toes on the second sock and realize i don’t have enough yarn and can’t get more. the toe up socks will help me bridge this problem by more fully utilizing my stash. so as long as i weigh the yarn i’m able to make better choices when it comes to the length of my socks. i hate having leftover yarn, so this book works for me! plus i admit to loving the designs and photography!